.How does one begin to tell the story of the humble climbing gear Co-op that has grown into one of the World's largest outdoor gear retailers? Answer: I offer here a few tidbits and thoughts. The Germ that began REI: Eric Lindahl of Seattle told me that during the 1960s he met Rudy Amsler. At the time, Mr. Amsler was an older Swiss man living in Eric's parents' mother-in-law cottage. Most regard Mr. Lloyd Anderson as the founder of REI in 1938. In that connection, Mr. Lindahl told me, "You may be interested in the person who told Lloyd Anderson about cheap high quality gear in Europe and how to order it. His name was Rudy (Rudolf) Amsler. 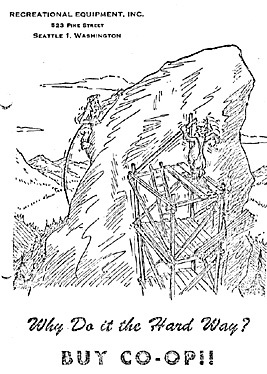 The story goes that after hearing Lloyd and other Seattle Mountaineers grouse about the poor equipment and high prices of mountaineering goods, Rudy showed him French/Swiss climbing magazines and the mail order ads within them. I can't say for sure but I suspect Rudy interpreted the ads for Lloyd and then helped Mr. Anderson make his initial mail order purchases from those European sources." Mr. Lindahl adds, "Coincidentally I met Lloyd Anderson in ~1980 when I worked in North Face's first store outside California." 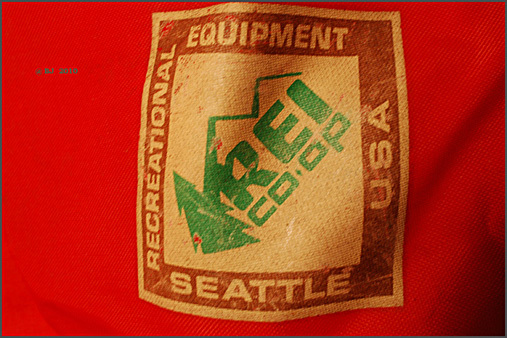 Here is some detail about REI from the company website, where it is stated that REI is the nation's largest consumer cooperative with more than 2 million active members: "In 1938, mountain climbers Lloyd and Mary Anderson joined with 21 fellow Northwest climbers to found Recreational Equipment, Inc. (REI). The group structured REI as a consumer cooperative to purchase high-quality ice axes and climbing equipment from Europe because such gear could not be purchased locally. The word quickly spread, and soon many other outdoors people joined the co-op. 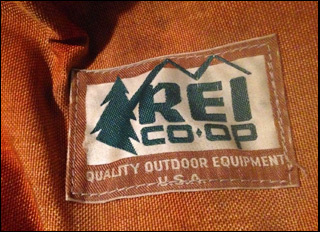 As REI grew, so too did the range of outdoor gear available to the co-op members." History of Gear readers should note that REI is unique in the History of Gear-- unlike nearly every other classic gear company, it has never been taken over by a Corporation-- remaining at least partially true to its roots as a Cooperative. Please Note: All Material is copyrighted, and no usage of my material is permitted unless explicit permission is granted by me, Bruce B. Johnson, owner of OregonPhotos.com, Contact: oldgear@oregonphotos.com . ..... Editors: Please contact me if you have interest in publishing....Others: if you were involved with one of the old-line, vintage gear companies and have a story to tell in these pages, please contact me soon. I will not attempt to summarize REI or provide a comprehensive account of its history. Instead, I will focus briefly on the REI of 1957. I will also include a snippet about REI's association with "Thaw." My hope is to introduce some additional perspectives on the story of much-smaller innovators such as Holubar Mountaineering and GERRY Mountain Sports. In 1957, Dwight Eisenhower was President of the United States, and there were only a handful of sources for quality backpacking and climbing gear. In California, there was only The Ski Hut/Trailwise, plus the bare beginnings of Stephenson's Warmlite.... In Colorado, there were only the Boulder twins, Holubar and GERRY. In Washington, there was REI Coop on Pike St. (although Eddie Bauer Co. was selling its down-filled jackets and sleeping bags, it was not a source of general backpacking/climbing gear in the same way that REI, Holubar and GERRY were). See page bottom for a brief description of some historical REI store locations over the years. 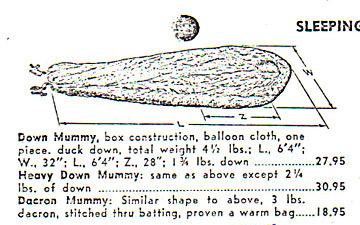 TENTS for Backpacking: as one can easily see in the catalog image below, tent design at REI was still struggling to rise above old-time Boy Scout "pup" tents. REI tent canopies are still made of cotton, heavy and prone to mildew in the wet, not to mention dark inside and difficult to waterproof. Poles do not bend or flex, are not shock-corded, and are essentially just "I" poles. A self-supporting tent design like a geodesic dome is still 20 years in the future.....Would you trust your life to this tent during the high winds and heavy snows of a high-mountain blizzard? Click here to see an image of the ultimate evolution of the A-frame style tent, a great example of which was the REI Denali Expedition, circa 1975. Far stronger and more evolved than the 1957-era A-frames, but destined nevertheless to be rendered extinct by the next generation of tent designs. 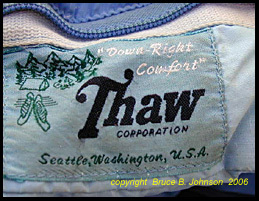 Thaw-- For many years "Thaw," a manufacturing company in Seattle, produced much of REI's down clothing and sleeping bags. The "THAW" name is actually put together from the initials of its founders' last names, first told to me by NW climber Gary Kirk, and later refined by the son of founder John Hartsfield, who told me, "[Dad] worked for Trager in the 50's/60's until he purchased the company from George, the owner. John Hartsfield started THAW corporation with Anderson, owner of REI, and Whittaker when they both also worked at REI on Pike." So "THAW" = "Trager, Harrington, Anderson, and Whittaker" (Trager made Trapper Nelson pack boards and various packsacks). "Anderson" of course was for Lloyd Anderson (REI founder), and of course "Whittaker," for Big Jim Whittaker, who joined REI in 1955 on invitation of Lloyd and worked there until 1979....Eventually, REI began to manufacture in their very own facilities, and so the "Thaw" label shown on a down sleeping bag purchased at an REI store is now a piece of REI's history (image contributed by reader Frank H., and reworked by me).... 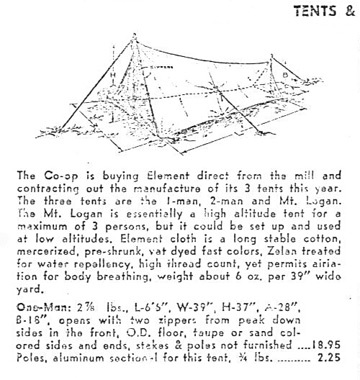 The reader will note that the camping scene in the upper left of the label is very similar to the scene shown in another old REI label, as shown in a previous image on another page (click here to see). My own REI membership # is in the low 60,000s range, and as a long-time member I am proud to see that the modern REI is alive and thriving, with no end in sight! The Company is active both as an on-line merchandiser and through a far-flung network of REI stores. Click here to visit REI's main website. 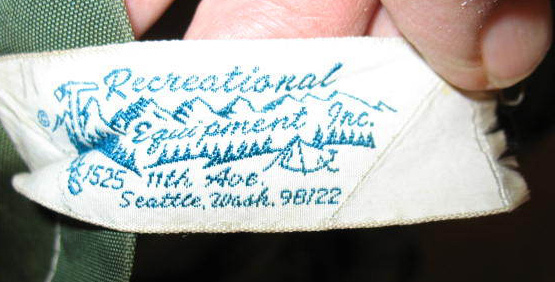 Below is another of REI's earlier labels, when, in this writer's opinion, the company was still relatively close to its roots as a true climber-backpacker oriented cooperative. I date this label to the early 70s. Main Page: Essays and pictures about the Pioneers of the Outdoor Gear Revolution, 1935-The Present, 45+ pages, six books about the History of Gear published, and still always adding new material! "1974 was the first time I entered REI and they were located at 1525 11th Ave, in a 3 story rough wooden timber warehouse that smelled wonderfully of creosote. The label below clearly displays the address 1525 11th Ave which is correct. You might consider changing the first line of text, the low-res scan is fine indeed and accurate. Finally, there never was an REI Museum, but I love the idea!!! Present Seattle address is 222 Yale Ave N, the Flagship Store, which is under 1 mile from the 1525 11th Ave location and that location is under 1 mile from the original location and the original location is under 1 mile from the 1999 Flagship Store location. These 3 locations plotted on a map nearly describe a perfect triangle, equal on all three sides! During the 1980s, there is a grand, multi-level store at 1525 11th. Ave, which actually was only some five or six blocks east of the 1957 store . Across the street was Feathered Friends, at 1516 11th Ave, and a block or two to the south was Crescent Down Works at 1015 E. Pike! What a great association of quality companies! I suspect that the big 11th Ave. store was also there during the 1970s. -- compliment David Y., a third-generation Seattle native. REI historic store locations-- some approximate and reader input is solicited! When I joined the Co-op and visited the store in about 1967, I remember a tiny place, very rustic and un-fancy, that was accessed by climbing a flight of stairs. This may have been the Pine St. location. During the 1970s and 80s, there is a grand, multi-level store at 1525 11th. Ave, which actually was only some five or six blocks east of the 1957 store . Across the street was Feathered Friends, at 1516 11th Ave, and a block or two to the south was Crescent Down Works at 1015 E. Pike! What a great association of quality companies! I suspect that the big 11th Ave. store was also there during the 1970s. In about 1999, the current Flagship store opened at 222 Yale Ave. North, with its giant climbing pinnacle visible from the I-5 Freeway. That location is only a mile to the NW of the old 11th Ave. store.